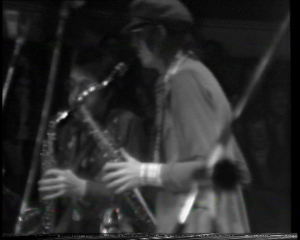 At the end of 2015 Steve Lindsey, founding member of Liverpool art rock trailblazers Deaf School, stumbled upon two 1/2″ open reel video tape recordings of the band, tucked away in a previously unknown nook of his Dublin home. 2016 is the 40th anniversary of Deaf School’s first album 2nd Honeymoon. With the landmark approaching, Steve felt it was an ideal time to get the tapes digitised. 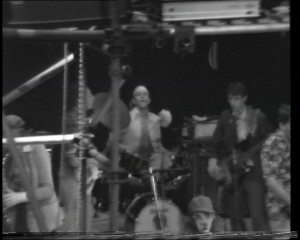 The video transfers done in the Great Bear studio will contribute to the growing amount of documentation online celebrating the band’s antics. Betwen 1976-1978 Deaf School were signed to Warner Brothers, releasing three albums. Deaf School nonetheless remain legendary figures to the people who loved, and were profoundly transformed by, their music. 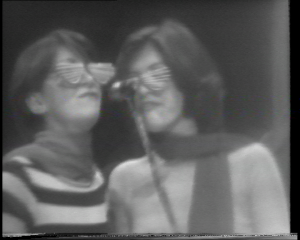 Deaf School’s performances were a celebratory spectacle of the camp and chaotic. The band took their lead from art music projects such as the Portsmouth Sinfonia, an orchestra comprised of non musicians which anyone could join, regardless of ability, knowledge or experience. ‘Everyone who wanted to be part of Deaf School was welcomed and no one turned away. The music was diverse and varied, drawing on rock and roll, Brecht and cabaret,’ Steve told us. The show was organised for Warner Brothers employees who had taken the train from London to Liverpool to see Deaf School perform. Porta-pak open reel video was revolutionary for its time: It was the first format to enable people outside the professional broadcast industry to make (often documentary) moving images. For this reason material captured on ½” videotape is often fairly eclectic and its edgy, glitchy aesthetic celebrated by contemporary documentary makers. The Great Bear studio has certainly received several interesting ½” video tapes from artists and performers active in the 1970s. We also did an interview with researcher Peter Sachs Collopy who discusses how porta-pak video technology was perceived by artists of that era as a ‘technology of consciousness’. Non-professional video tape recordings made in the 1970s are, nevertheless, fairly rare. At that time it was still expensive to acquire equipment. Even if videos were made, once they had served their purpose there is a strong possibility the tape would be re-used, wiping whatever was recorded on there. With this in mind, we are in a lucky position to be able to watch the Deaf School videos, which have managed to survive the rough cuts of history. 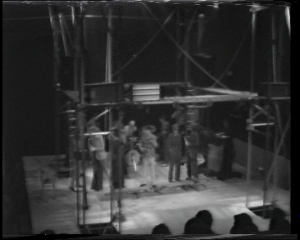 The video of the Everyman Theatre performance was cleaned prior to transfer because it was emitting a small amount of loose binder. It was recorded onto Scotch-branded ½” video tape which, in our experience, pose very few problems in the transfer process. The other tape Steve sent us was recorded onto a SONY-branded ½” video tape. In comparison, these tapes always need to be ‘baked’ in a customised-incubator in order to temporarily restore them to playable condition. The preservation message to take away here is this: if you have ½” video tape on SONY branded stock, make them your digitisation priority! Steve told me that members of Deaf School ‘always kept in touch and remained friends’. Over the past 10 years they have reformed and performed a number of gigs in the UK and Tokyo. In 2015 they released a new album, Launderette, on Japanese label Hayabusa Landings. When they return to Liverpool the gigs are always sold out and they have great fun, which is surely what being in a band is all about. Many thanks to Steve Lindsey for talking to us about his tapes! This entry was posted on Monday, January 25th, 2016 at 4:50 pm	and is filed under Video Tape. You can follow any responses to this entry through the RSS 2.0 feed. You can leave a response, or trackback from your own site.